With many award nominations now open for public vote, it seemed timely to celebrate the arts that make up Black British Culture here in the UK. 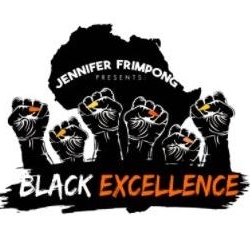 From painting and design to music, production, literature, JENNIFERFRIMPONG has it covered! Firstly, artists and designers. Sarah Owusu is an absolute genius with a paintbrush. Recently nominated for a Black British Entertainment Award, please click here to vote and show your support for living artists! Koby Martin has some impressive artists amongst his clientele, including the likes of Wizkid and Krept and Konan! This talented artist has continued to go from strength and is actually holding a 'Solo Exhibition' next weekend at 'The Gallery, E1 9JU', detailing his experiences being a Ghanaian immigrant here in the UK. Click here for more information! I have followed two amazing young graphic designers on social media and their growth and portfolios have grown immensely. ToluDK and Tiane, known across all socials as WhyBleach. Very big shout out to them both for their amazing work domestically and internationally. Onto all things music. I cannot speak on the music scene over the last year without paying homage to the real pioneers of the movement such as the Adenugas, Wiley, Giggs to name but a few. We have been blessed enough to receive some fantastic albums and mixtapes this year and several hit tracks from talented artists. Some of my favourites include Giggs (Wamp2Dem), Bonkaz (Quality Control 2.0), Suspect OTB (Loading), Mo Stack (High Street Kid), J Hus (Common Sense), Stormzy (Gang Signs and Prayer), Krept and Konan (7 Days & 7 Nights) and Wretch 32 (F32). I wonder which UK artist will close 2017 for us with an awesome new project! "This year I'm bussing all the mandem, next year it's money and gyal", Hardy spoke the damn thing when he dropped that bar his latest track 'Super Soaker'. The collaboration and genuine hunger for excellence in the community is evident and a number of our young stars include Hardy Caprio, OneAcen, Dave (let's just pause for a minute with Dave. If you have not listened to 'Question Time' yet, stop reading this post, go and listen to it, take it in and then come back), Yxng Bane and Not3s. I have linked my favourite tracks to their names, clickthrough and check them out! There are literally so many more artists that I believe deserve more recognition in our music scene. My top 3 (kind of) include the whole Hella Turnt team (comprising of Kid Bracer - had to keep it 50 x 2 baby! - La Swave, Ronson, the beautiful Svga and Jordan James) as well as Shae Universe and Levelle London. I remember watching Levelle on Sing Out Loud Sundays on YouTube like 5 years ago and I am so glad he has continued doing music and pray he gets the break that he deserves! Having seen the Hella Turnt grow from initiation (see what I did there La Swave) up until now is amazing and I genuinely believe that they will be a force to reckoned with, this year and in the years to come! Links to some of my favourite tracks by each artists are linked - check them out! I think we need to give our producers more credit, big up each and every one of you. I am not the most clued up with the technical terms when it comes to music but without the producer there is no product (come see bars!) A few of my favourite producers in the scene right now are (in no particular order, of course): Firstly, Mr ATG Musick himself, producer of recent LottoBoyz hit 'Plantain and Dumplin' as well as several of AdeJosh's tracks including 'Test Me'; JAE5 the genius behind JHus' 'Common Sense', alongside Tobishyboy, who recently signed a publishing deal with BMG UK! Finally, WildboyAce who has produced several bangers this year including Olami Still's Hater, Sy Ari Da Kid's Culture Love - definitely one to watch in 2018! Platforms like Radar Radio and Reprezent Radio have become the real voices of young London, giving rise to fantastic presenter talent like Reece Parkinson and Hemah. I cannot speak on media outlets and platforms without bigging up the likes of LinkUpTV, Jamal Edwards, the whole SBTV team, Posty and the whole of GRM Daily. Can I just say Posty is literally so inspirational! After hearing him on a 'No Carbs after 7 Podcast' episode, I realised how inspirational, business-oriented and down to earth he is! I would love to interview him one day (definitely speaking it into existence!). There are several upcoming platforms that promote a lot of underrated talent such as 9Bills, Mixtape Madness, Urban R3volution, Explicit London and Feat Mag. Moving onto some absolute geniuses behind the camera we have: award-winning and nominated MayowaHD, who currently works for GRM Daily has shot and directed some amazing visuals, including Burna Boy's Homecoming! ; JM Film's very own TShisz Nelson, talented director of some of my favourite videos this year: NewAgeMuzik 'Serious', SK 'Ose' and Maleek Berry 'Eko Miami' to name but a few. Moving on now to Mr Marv Brown, co-creator of Michael Daapah's #SWIL, Marv Brown has directed some amazing content from music videos to wedding trailers and videos over the last few years and it is heartwarming to see his work getting the recognition it deserves! Finally, Danny Wonders, CEO of Wondervision Films has directed several music videos and short films, including 'A Lesson Learnt' and the highlight reel for WizKid's recent concert at the Royal Albert Hall. It goes without saying that his work rate is indeed undisputed! Before I forget, The Creative Juice Podcast is an amazing fortnightly podcast, hosted by Lekhani Chirwa, Josh Bridge and Nelson Adeosun. They aim to provide an insight into the behind-the-scenes of Film and TV, given their collective wealth of experience. Nelson Adeosun is a researcher and filmmaker who has worked for a number of companies including Discovery and has worked on a number of BBC4 and Channel 4 shows, and Josh Bridge who produced 'Heels Off' as well as 'BET: Being Mary Jane Uncovered'. Check them both out! In celebrating the arts and culture at large, I cannot forget three beautiful and amazing authors of 2017. Imani Shola, a 21 year old undergraduate at Cambridge University and now author of book Heart Shards and Lip Balm, a collection of self-care poetry and affirmative notes. It is a beautiful and refreshing read. Please support Imani and purchase her book here. Finally, my absolute fave, Miss Kunmi Daniel. If you haven't got your copy of Phases, what are you doing? Fantastic read and I cannot wait for the sequel! Waterstones recently picked up Phases and it is now available from their website - such an amazing achievement - click here to purchase your copy. Kunmi was recently on 'Off the Cuff Podcast', click here to hear more about Phases and her journey as an author thus far. To all those featured, thank you for being so amazing and putting your talent and craft out there for us all to see and celebrate. We appreciate you, I appreciate you! I'll tell you what I think needs to happen across the board. I think we need to protect and invest in our talent here in the UK. We have a wealth of home-grown talent with those discussed above a mere fraction of it! Cultivating an environment of excellence and investing in our talent will continue to cause the UK to level all the way up and become a force to be reckoned with on the international playing field. I would love to see more black-owned talent management labels, black-owned publishing houses and so on and so forth. Please ensure that you keep up with the journeys of these awesome creatives - direct click-through links to their main social media pages have been created on their names so simply click their name and be taken to their pages.